I'm still pretty new to the site and I'm really loving all of the support that everyone gives to each other! So now it's my turn to help! I am 24 years old, 120 pounds, and just beginning my Accutane treatment Today! I was on the fence for a very long time about whether i really wanted to resort to such a severe option to cure my acne. I have had persistent moderate acne for about ten years and I have literally tried EVERYTHING! This year has been particularly rough on me with some stressful personal situations and a lot of hormonal changes and my skin has just gone to the gutter! I've never delt with more severe or persistant acne before! So I'm still super terrified of all the possible symptoms but I have until October 23, 2010 to figure this out! I'm very optimistic and I have my fingers crossed that this will be the answer! I will walk down the aisle to my future husband saying ... "wow your skin looks beautiful"! So wish me luck and I'll make sure to share my story the best that I can! Congratulations on the engagement. That is wonderful, and an excellent form of motivation for getting clear skin. I hope accutane works well for you It seems to do so for most people. The side effects to ME really aren't that bad. I think they're quite tolerable. I hope you'll be fine. Our stories are pretty similar. I'm 23, 125 lbs, with VERY persistent mild/moderate acne that I've had since I was 11. I just got the approval for accutane today (now gotta jump through the iPledge hoops!). I'm hoping to start after the new year. One of my major reasons for wanting accutane besides just hating my skin was that my boyfriend has been talking about proposing and marriage, and I definitely don't want acne on my wedding day! Anyway, good luck, and I look forward to watching your progress! Congrats! Your story is really excited. Being engaged is a big deal! Kimminiz - your accutane log was one of the first I went through and I really hope my time on accutane works out as well! I'm a little nervous because I always feel like I'm in that small percentage of anything that ends up with the wacky rare side effects lol But I'm going to stay positive! and even if I do get the side effects it's worth it in the end right! Clear skin on my wedding day has got to be the ULTIMATE motivator lol Would you mind if I ask what products you used on ur face during your time on accutane? was there anything you really liked? My doctor has just told me to use Cetaphil cleanser and moisturizer morning and night so I think I'm going to try that to start than add in as it's necessary. Runraisin19 - thanks for the congrats! i've definatly had my fair share of dancing to celebrate I hope I can clear up that fast! My acne isn't severe, I've only ever recently had a cyst that I had to deal with otherwise it's all very hormonal and on the surface, A LOT of white heads and a TON of black heads. My biggest problem has to be my scarring! I thinka t any given time I have about half a dozen to a dozen zits to contend with my the scars of the last three months always hang arround bright red like they happened yesterday! Any suggestions on helping out the scarring while on the Accutane? I know I can't use any traditional topicals on my face so I guess I may have to wait until after the accutane and try to clear up the scarring. S a r a - thanks for the congrats I'm LOVING THE ENGAGEMENT!!! Any suggestions for the beginning of an Accutane journey to make it easier? I'm just trying to stay very hydrated, eating well (wouldn't hurt to shed a couple pounds before the wedding either lol ) and moisturizing whenever I can. Congrats on your engagement! That is so exciting, and just think you won't have to worry about dealing with acne when you walk down that aisle! I am a little ahead of you, I started on 40 mg on 11/23. I'm really excited and scared to be on accutane but I feel like it's the only option I have left. I think all of side effects and craziness that comes along with these pills will so be worth it! As far as scar treatment, the best while you're one tane is don't pick! It's really hard not too but it definitely helps. I was told that it's better to start treating the scars after you're done with the course since it's hard to tell in the beginning if you are done breaking out. But if you do find a way, please let me know! Anyways, just wanted to say good luck and I will be following your progress! Day 8 Today (Starting Week 2)! - So I'm a little frustrated. My doctor has put me on a super low dose of accutane for six months. I just completed one of two weeks on 10 mg and next week I'll increase to 20 mg for two weeks. After reading a lot of logs and going through my first week I'm already impatient! Most people start at a much higher level of meds and see the effects right away. Although some of the effects aren't positive, like an IB, at least they know something is happening! I think the worst thing thats happened this week has been not knowing if anythign is happening! I mean I have had "potential side effects" but they can all be explained away without the accutane. 1. Dry skin & Lips- I'm in very chilly dry canadian weather, so my skin usually gets dry in the winter! 3. Sore joints and back pain - Well I always get a sore back arround my period so that could be it! and my joints could just be because of the cold again! 4. Breakouts - Well I'm usually very preventative in my skin care regiment and I pretty much stopped everything when I started the accutane so all new actives may just be a result of not keeping them at bay anymore! And thats about it! I almost wanted to increase my dose to 20 mg this week after 7 days but my Fiance has convinced me that I'm just being impatient and to stick it out lol. Other than the above symptoms I haven't had too difficult a time. I actually don't feel as embarrased about how awful my skin is looking right now because I feel like I have a good excuse for once. I can just blame it all on the accutane lol. The only time I've felt self-conscious so far has been when meeting wedding vendors! It sounds silly but I met with a photographer last night and I just felt so bad that this photographer may have to photoshop my wedding or engagment pictures for hours so I didn't look awful! ugh well hopefully my progress isn't so slow and I do end up clearer before I have any pics done. I took some new pics this morning to put up. They didn't come out great but they show what they need to. I feel like a few days after I started the accutane last week all the "potential" pimples that I've been holding back, decided they were free to burst out in a fury! So I had a good 7-8 actives come out in the span of a couple days! and man were they painful! the "I can't move my face or even touch it too hard" kind of painful! Each new spot is just soooo sore! and I don't usually get that too often. I've also been reading that taking some vitamine and mineral suppliments like Vit C, and Zinc can be beneficial in the healing process. Any ideas? I would love a way to decrease my scarring as I progress rather than when I'm done with the drugs. Thanks again everyone for the congrats I hope your journeys are all going well too! I am right there with you hun- getting married July 10th- doing all I can to get clear by then! I have yet to try Accutane again (first run was about 6 years ago)... but I will consider for sure. I wish you the best of luck- but you are beautiful regardless! Have fun making all the plans- dont let it stress you out too much! Are you taking Accutane or a generic? I'm on 10 mg of Clavaris/day. Your are a beautiful girl - I really hope the accutane works for you and with the positive attitude that you show through your blogs Im sure it will!! Im starting it next weds and am extremely nervous - hoping for a miracle but arent we all... Im heading on vacation with my guy the first week in march so with any luck at all the accutane will help me 11 weeks from now... I was thinking he might pop the question on that trip hehe but by the looks of things, i think it will be wishful thinking - with my crazy obsession and depression lately with my skin and his amazing life of the perfectly good looking tall dark and handsome guy who just bought a house and is loving life, lets just hope we stay together through this experience hehe! When you date someone that doesnt really understand what its like to be insecure its hard for me to expect him to be fully understanding and supportive... learning a lot through this whole experience. Keep us all posted on how things are going - and i will do the same once my treatments start - I wish you the best of luck!!! So I got back from soccer tonight, at 12 so not a fun time to play soccer but it was still an awesome time! I washed my face and when I looked up from the water I had an awful nosebleed! Honestly I was really scared for a min I don't think i've had a nose bleed in almost 15-20 years!!! I figured it just had to do with my nose being dry because of the Accutane and the cold weather (It was -8 today and gross out!). I should probably be getting to bed but I was just a tad freaked out and thought that putting down on ... a computer screen may help and it has This is normal right? any advice or similar symptoms guys??? I know it can be a symptom but it's not one I've read often in many other logs. So I'd love to hear if anyone has dealt with this? I mean it's only day 12 on 10 mg so it seems a little silly. Meh... maybe I jostled my head around in soccer too much and it has nothing to do with the accutane and more to do with me kind of sucking at the game lol. Crevin - I'm on Accutane Roche I assume that's the original one but I'm not sure? Any certain symptoms for you yet? I've found that the lips are definitely dry now but only for about half the day. And my skin is peeling on my nose as well as kind of delicate too. I scratched my nose while driving yesterday, barely touching my face and it still left a scab as if i had dug my nails in! not the best look the next morning. I hope your acc-journey is going well too! I'm excited to increase the dose.... as long as it doesn't mean more bloody noses. What's your dosage plan? Italian Boy - Thanks I'll probably start "auditioning" the makeup artists now so I know that they're good! that way if I know they can cover the worst stuff than they'll definitely be able to handle the good skin they'll have to work with later! Amic13 - I'm pretty sure the last two weeks of planning have just made me understand why people elope lol. No really it has been fun, but we're getting married in less than a year and it was hard to find good venues and churches that weren't already booked up to 2011! But looks like venue is done and church will be done by thursday! yay Hope your wedding plans are going well too. 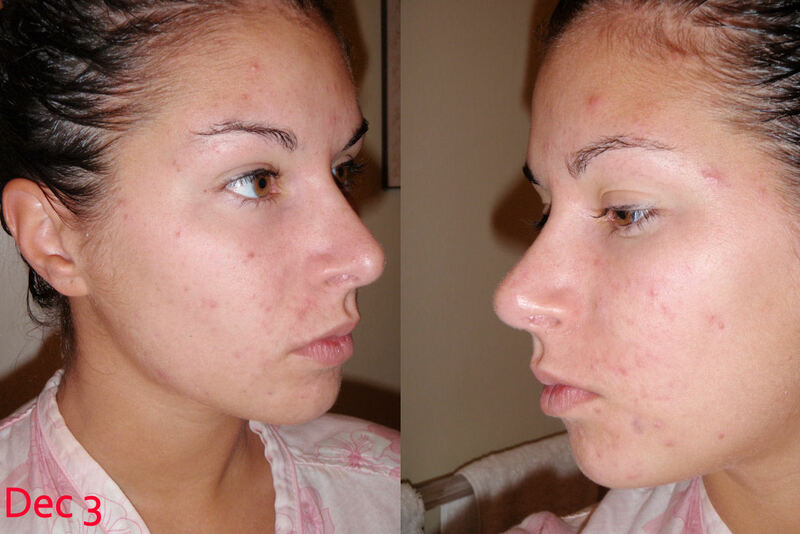 has your acne returned is that why your considering the accutane again? It lasted 6 years for you? any triggers in general that made it come back?? your acne is on the lower end of mild, i can't believe your derm put you on accutane, thats absolutly insane! I feel bad for your child. Deciding to take accutane was not a decision I made lightly. I did A LOT of research. I spoke to a lot of people a great number of them medical professionals as well as other accutane users. I heard good stores and bad stores,good end results and bad end results. In the end my decision was made based on the logical fact that my acne, although moderate, is persistent and resistant to ALL other treatments I have tried. And even if you would yourself judge it as mild, who are are you really to say? Unless you have a medical degree or have published some illuminating literature on the topic I really don't think your the person to tell me what the degree of my acne should be considered. I'm pretty sure you didn't bother to do your research and perhaps read one of my other posts outlining the struggled I have been through over the last 10 years. Instead you were busy being judgmental and completely unhelpful and unencouraging to this log. I think there is one too many people leaving comments here (aka - YOU) that are jumping to judgements and unqualified conclusions EVEN faster ... and that is really an even bigger SHAME. Day 13 - All is well. I'll post pics on Thursday, still breaking out but not terribly, mostly healing the actives from last week right now. Well I woke up with three new actives this morning. The deep down rooted in painful kind grrr i was hoping i was going to have it easy there for a minute serves me right I guess. Anyways Other than the gigantic pimple that has taken up residence between my eyes things are going pretty well. My skin was extra dry this morning but my lips are much better! As far as your skin goes- be patient my dear- you look to have very nice skin as it is, so just let the accutane run its course... I have no doubt that your skin will be flawless by your wedding day, and probably long before that! I found, when I was on accutane, that the thick Cetaphil moisturizer did wonders for my dry skin. Also, my sensitivity to sun lasted for quite some time after my course- so be very careful if you are planning on getting a little color before your big day ok??? Self-tanners are wonderful if you go with the right color. My lips are still dry on and off but that's about it. No other symptoms. I usually break out like a monster this week of the month and that hasn't happened either... yet! So I'm optimistic that the accutane is working but I just can't feel it! I can't complain about that! Hey amic13 It was scary to hand over the deposit! But i was more relieved than anything else. I always thought I'd have a year or more to plan a wedding and doign it in 10 months seems a little tight to me so I was glad to get the when and where done. As far as I'm concerned the rest is all fun! How are your wedding plans coming??? Any dresses picked out yet?? just caught myself up on your log.. glad to hear things are going well for you! congrats on the engagement, too! So Three days on my increased dose and no change... in fact I'm pretty sure I have a new cyst coming to visit my chin just in time for christmas with my family as well as at least one new pustule right smack dab in the middle of my cheek bone. My skin does seem to be a lot less oily though! I was a godmother to my nephew today when he was baptized and was kind of worried because I got all pretty this morning at ten and had to stay all pretty and made up ALL DAY for pictures and what not .... I carried my WHOLE makeup bag with me for when the oil slick would hit today and i would have to re-apply BUT IT DIDNT HAPPEN! I had maybe a touch of oil but nothing I couldn't maintain with a blotting paper or two YAY ! But I'll take what I can get for now! HAPPY HOLIDAYS EVERYONE! HOPE YOU ALL HAVE A GOOD ONE! NOTHING I've tried has ever budged them. Not Retin-A, not BHA, not AHA. Nothing. So I'll get blackheads, which will turn into noninflamed comedones, which I will try to extract (because otherwise they will just chill like that for months...colorless bumps all over my face? I think not. ), and while I am often successful, I also sometimes make it worse, and then I get cysts. YAY. Hey girl! Just checking in. Our stories are so similar except that I was on Accutane once before almost 10 years ago. I went off the pill in favor of a copper IUD and I broke out horribly and it just got worse and worse. I was just going to wait it out. And then I got engaged! And I was like OH NO I can't get married like this! I just started my third month and I get married May 2nd, 2010. My acne is now mild (thanks Accutane course #1) but really resistant to anything and everything (f you, genetics). I'm clearing up nicely on Accutane so far even though I've had a few actives this month (oh no!!). I'll be checking in on your blog for your updates! Best of luck to a beautiful bride to be! Seriously, you are gorgeous with or without Accutane, so keep your head high.